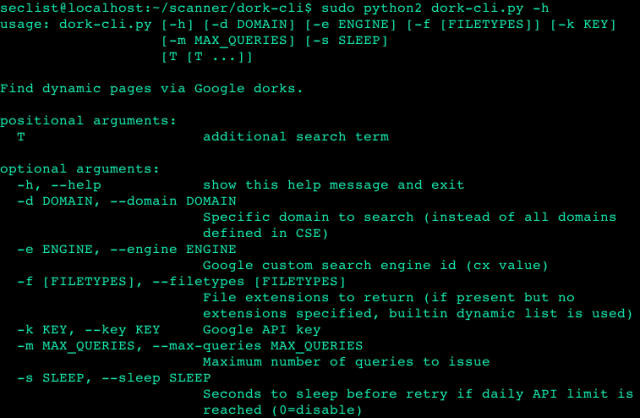 dork-cli is a Python-based command-line Google Dork Tool to perform searches against Google’s custom search engine. A command-line option is always good as it allows you to script it in as part of your automated pen-testing suite. It will return a list of all the unique page results it finds, optionally filtered by a set of dynamic page extensions. Any number of additional query terms/dorks can be specified. dork-cli was designed to be piped into an external tool such as a vulnerability scanner for automated testing purposes. In order to use this program you need to configure at a minimum two settings: a Google API key and a custom search engine id. Find dynamic pages via Google dorks. The free Google API limits you to 100 searches per day, with a maximum of 10 results per search. This means if you configure dork-cli.py to return 100 results, it will issue 10 queries (1/10th of your daily limit) each time it is run. You have the option to pay for additional searches via the Google API console. At the time of writing, signing up for billing on the Google API site gets you $300 free to spend on API calls for 60 days.